In a non-stick pan over medium heat, sauté the carrots, onions and garlic in olive oil until softened. Season with salt and pepper, remove from pan and set aside. Add ground chicken to pan and return to heat until cooked through. Continue to stir the meat while cooking to help it crumble in the pan. Reduce heat. Add the vegetable mixture, Gochujang Sauce and soy sauce to the pan with the ground chicken. Sprinkle with flour and stir until combined. 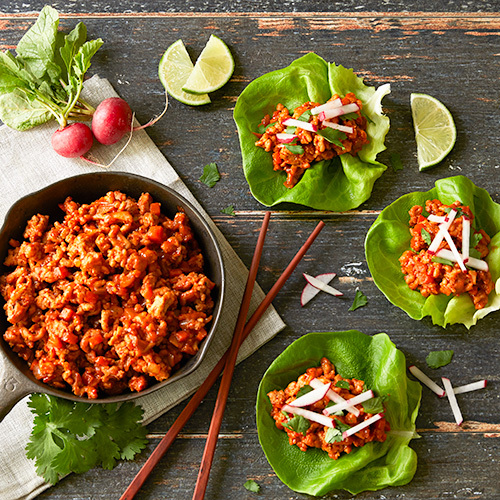 Serve with lettuce leaves, radish and cilantro.